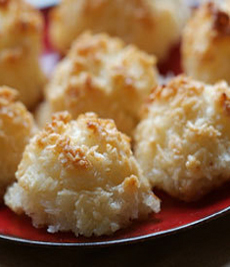 Homemade coconut macaroons are a sweet treat. Photo courtesy Recchiuti Confections. Says San Francisco chocolatier and patissier Michael Recchiuti of Recchiuti Confections, “Golden and crispy outside, tender and chewy inside, coconut macaroons are one of the most basic and satisfying treats in my bag of tricks. Unlike most of the macaroons out there, these are only lightly sweetened, a quality that really highlights the flavor and texture of the good coconut. This recipe can be made kosher for Passover with the substitutions provided below. You can enjoy more of Chef Recchiuti’s recipes in his book, Chocolate Obsession. You may also enjoy the history of macaroons. Flour: Substitute 5/8 tablespoon potato starch for the 1 tablespoon of flour. Vanilla Extract: Vanilla extract is made with alcohol, a fermented substance that strictly observant Jews will not consume on Passover. Look for kosher-for-Passover vanilla powder and substitute one tablespoon of vanilla powder for one teaspoon of pure vanilla extract. Move the rack to middle-shelf level and preheat the oven to 325°F. Line the bottoms of two 12-by-18 inch sheet pans with parchment paper. In a bain-marie or double boiler combine the egg whites, sugar, honey, vanilla and salt. Whisk over medium heat until frothy and warm (120°-130°F). Using a spatula, fold in the coconut and flour until just incorporated. Be careful not to overmix. Place rounded tablespoons onto the prepared pans. Bake on the middle shelf of the oven until golden brown, about 20 minutes. For chocolate-dipped macaroons, let cool completely. Melt chocolate in a double boiler or in the microwave (microwave instructions below). Dip the top and sides in melted chocolate; set on wax paper to set. If you want to then dip the bottoms, you can completely enrobe the macaroons. Serve warm or at room temperature. Store in an airtight container for up to 1 week. Start with a clean, dry, microwave-safe bowl that does not get hot after several minutes in the microwave. (A bowl that is too hot to handle can scorch the chocolate). Chop chocolate into small, even pieces and place into bowl. Microwave on the low/50% power setting or heat the chocolate at 30-second intervals. If your microwave does not have a turntable, manually turn the bowl each time you stir the chocolate. Stir at intervals until the chocolate is melted. Coat macaroons immediately. Lifestyle Direct, Inc. All rights reserved. Photos are the property of their respective owners.